Dr. Beverly Chado graduated from University of Maryland and received her doctor of optometry degree from Pennsylvania College of Optometry. 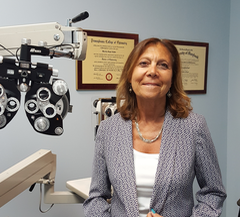 She has been practicing optometry for 33 years and opened Eye to Eye in Germantown in 1989. Dr. Chado is a member of the Maryland Optometric Association and the American Optometric Association. She resides in Frederick.